Ten years ago, on April 16th, 2006, NYCBikeMaps.com launched as New York City’s first interactive bike map. Admittedly, it was slow loading, prone to crashing and incomplete, but it harnessed the power of Google Maps to help cyclists navigate the City as interest in cycling began to grow rapidly and the City increased investment in cycling infrastructure. Looking back, it is incredible to see the progress that has been made: since 2006, more than 500 miles of new bike lanes and bike paths were added to New York City’s streets while the number of people cycling nearly tripled. The cycling community in New York City is robust, resilient and it is an honor for NYCBikeMaps.com to be a part of it. Looking forward, it is exciting what New York City can achieve if momentum is maintained, Vision Zero becomes more than a political slogan and streets are designed for people. 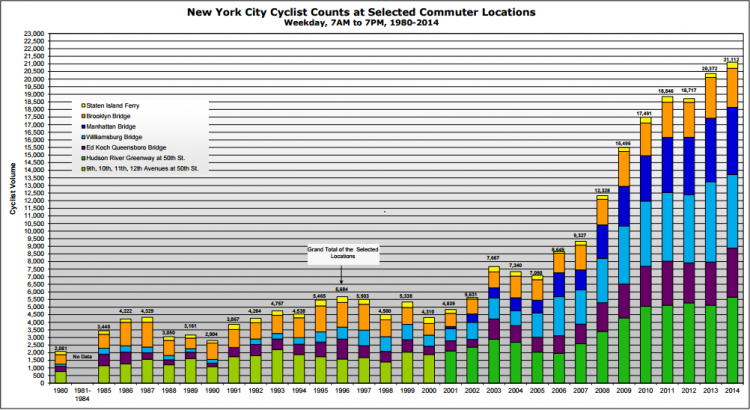 Recent NYPD actions and lawsuits from powerful people indicate there is a ton of work still to be done, but support for cycling infrastructure is strong and more New Yorkers are cycling than ever before, so it is a great time to grab a bike and go for a ride.